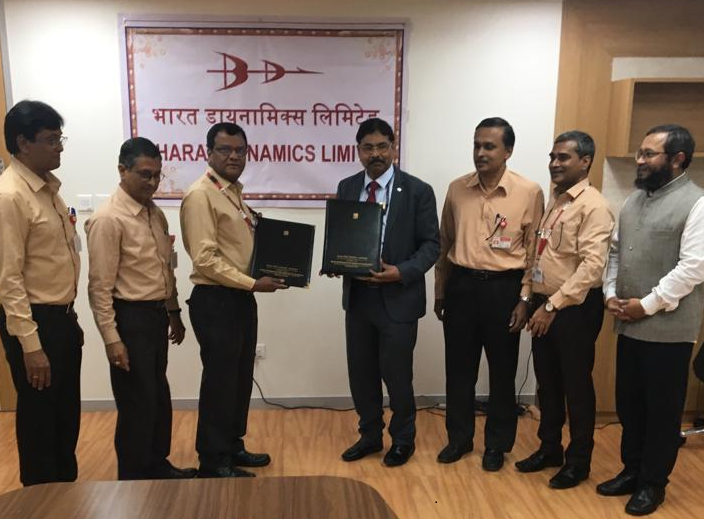 National Research Development Corporation (NRDC), New Delhi signed a Memorandum of Agreement (MoA) with Bharat Dynamics Limited (BDL), Hyderabad, a public sector enterprise under the Ministry of Defence on 1st February, 2019. The purpose of this MoA is to provide support to BDL for IPR consultancy in Patent filing for the technologies developed by BDL and in organising capacity building training programmes and workshop for creating awareness in IPRs. The MoA was signed by Dr.H.Purushotham, CMD, NRDC and Mr. N.P.Diwakar, Director (Technical), BDL. Senior officials Mr. M.Sreedhar Rao, Additional General Manager, D&E, BDL, Dr.M.Chandrashekhar Swami, Senior Manager, Electronics, BDL, Mr. Vakati Venkata Ravi, DGM, BDL, Mr.Ashish Tripathi, Deputy Manager, BDL and Dr.Sanjeeva Kumar Majumdar, Manager, NRDC were also present.